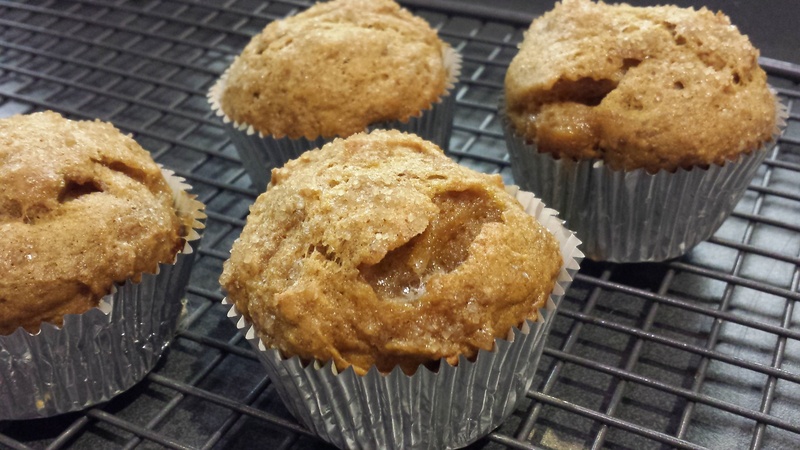 Raw cane sugar lends a sweet crunch to these oh-so-moist pumpkin muffins with a marshmallow surprise in the middle; a fun breakfast treat for all ages. Preheat oven to 350 degrees. Line two 12-well nonstick muffin pans with 24 paper liners. Combine flour, cinnamon, baking soda, and salt in large bowl. Beat butter, granulated sugar, dark brown sugar, pumpkin, eggs, vinegar, and water in large bowl with hand mixer on low speed until just blended (mixture will have small flecks of butter). Add flour mixture to pumpkin mixture; stir to combine. Spoon batter into prepared muffin cups, filling 1/4 full. Gently press 2 mini marshmallows into center of batter. Fill cups 2/3 full with remaining batter. Sprinkle tops with 1/4 teaspoon raw cane sugar. Bake on middle oven rack for 25-30 minutes or until toothpick inserted in center comes out clean. Cool in pans for 10-15 minutes before removing to wire rack to continue cooling. Serve warm or at room temperature. Store in airtight container. Whole wheat pastry flour can be substituted for the white whole wheat flour.